Though the alert won't reach everybody, Quebecers with a compatible wireless device connected to an LTE network can expect to hear a tone similar to an ambulance siren at 2:55 p.m.
Wireless devices across Quebec are supposed to buzz this afternoon as Canada's new Alert Ready system is again put to the test. They will feel their device vibrate and see a notification displayed on their screen. The Quebec test will occur one hour after the test is conducted nationwide. A national test will validate the end-to-end performance and reliability of the new system everywhere in Canada. 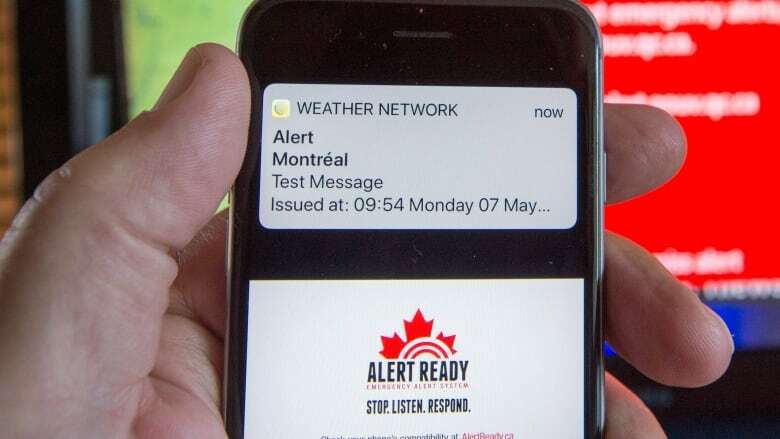 The last time such a test was conducted back in May — when the new system was making its debut — it didn't go so well in Quebec as no mobile devices received the alert anywhere in the province. When that happened, officials said the problem appeared to occur between emergency management in Quebec and Pelmorex Corp., which operates the system. The test did, however, work successfully on TV and radio. This time around, the alert will again be broadcast on television and radio as well as to compatible devices. The president and CEO of the Canadian Wireless Telecommunications Association (CWTA) Robert Ghiz says there are a number of reasons why a person's device won't receive today's alert. It could be anything from device compatibility, access or connection to an LTE network, he explained in a statement issued earlier this month. Device software and settings can also affect the service. "That's why we're encouraging all Canadians to check their device compatibility on their wireless service provider's website, and ensure that their device has the latest software update installed," Ghiz said in the statement. Canadian Radio-television and Telecommunications Commission (CRTC) requires all wireless carriers be capable of warning their subscribers of imminent threat-to-life situations, such as tornadoes, floods, Amber Alerts or terrorism. The aim is to have all devices for sale in Canada be compatible with the Alert Ready system by April 2019.